5 Sept 2012: [Extension] More progress on the extension with the assistance of Andy the joiner. We did the cutting for the side wall panels yesterday, and were surprised today to find how long it took to do all the final gluing and fitting. Instead of getting it done by 10am, it took all day, working hard! 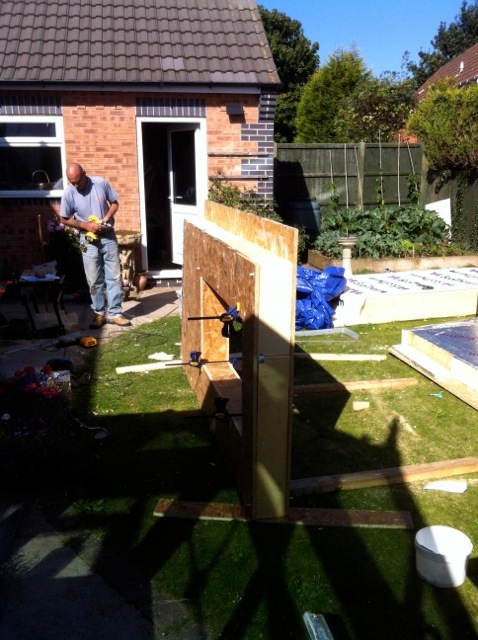 Cutting foam into shapes to fit tightly around the panel and the window opening in the East wall. 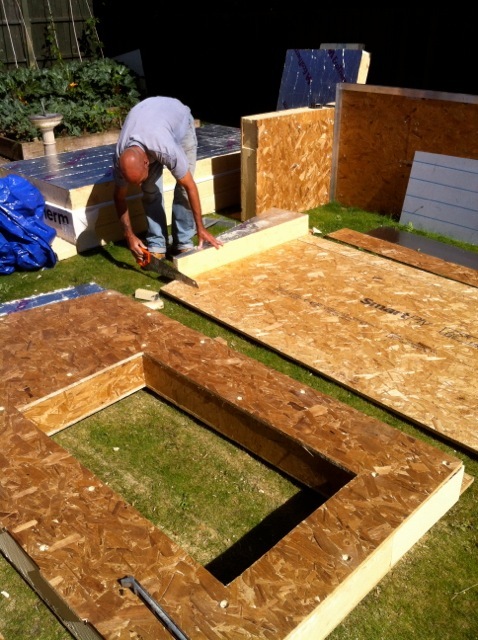 All foam blocks are glued to each other, as well as to the OSB surfaces. The front fits the back precisely - phew! Now getting foam cut for the West wall. We don't glue down until both panels are ready to glue one after the other. Gluing the foam blocks to the dry corrugated side of the OSB board, taping and gluing all joints and touching surfaces. The gluing is done, and once the corners are clamped and a few nylon rods are through, it can be turned upright, to prevent any bowing in the panel and to allow the remaining rods to be fitted. Close-up of the interface detail that will eventually meet the roof cassettes, ensuring that there is no thermal bridging at the corner. 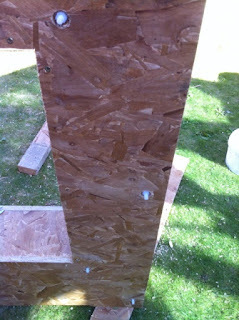 The window reveal is fully lined with OSB board, and secured with a line of self tapping screws. 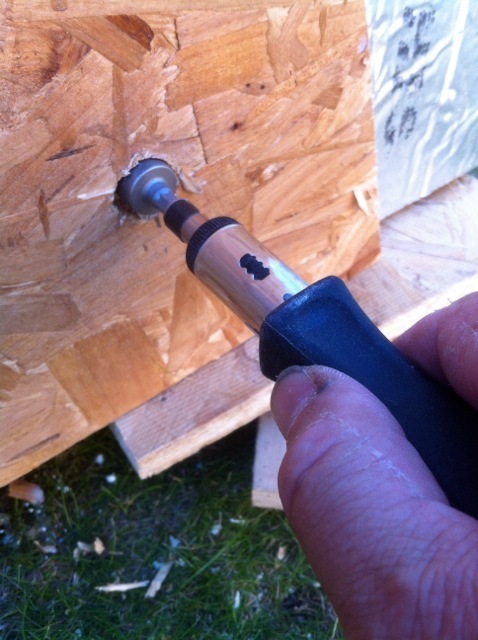 The panels are secured with nylon 8mm rods at regular intervals to clamp the board to the glue. Each nylon rod is tightened up gradually a few turns at a time, and the timber and foam move closer together, then one tightens a bit more, and so on. Like tightening down the head on a 6 cylinder engine. The garden is being used, but it isn't being turned into a tip. The grass is cleared every night, and the concrete slabs are swept of sawdust too, so that every morning is a clean fresh start. Interesting that you are fabricating your own SIPs. Is this primarily a cost saving exercise? I note that you actually penetrate the SIP with the nylon rod - doesn't that create a thermal bridge in itself? I ask because we are quoting for a PV system on a SIP roof and are concerned about how to best mount the system. Hi. we originally ordered only 10 metres of nylon rods, but have finished using 34 metres, they are that good!! Now that we have a technique, we use them more than first intended. 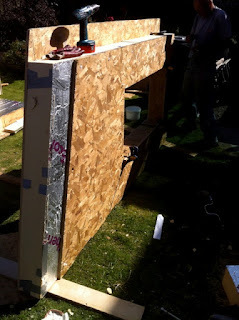 We cut them to 200mm units with a handsaw. Theres no measurable thermal conduction through them, and they are so strong, no matter how much we tighten them up, not a single one has slipped its thread. 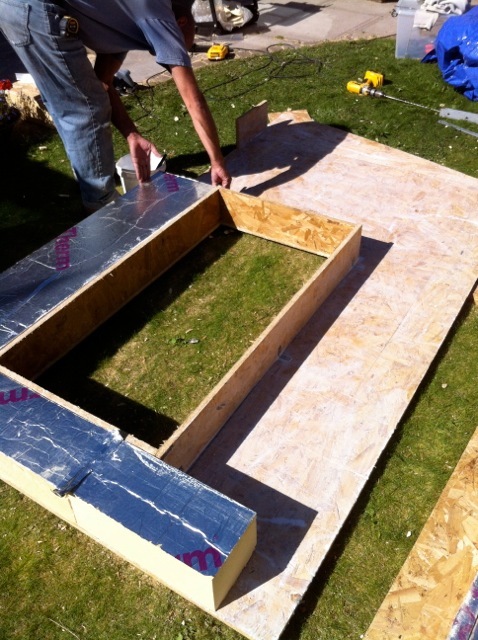 If you have a sips construction, you could use this method for fixing solar panel rails firmly. We countersink the thread so that the nut is level with the face of the timber. The nuts have their own spreader profile, like a washer. If you are in the UK, they come from one supplier in the UK, called BLUEMAY 01380-821821. If you need only a small number, I might have plenty left over by the end of the week. We are hand crafting out own SIPS panels for several reasons. One because at 1m x 3.6 m its probably too small for a commercial supplier to do. Two because its a complicated shape sectionally that they might not be willing to do. Three because its Fun and Research. Four because we want to hand craft each junction to avoid thermal bridging. 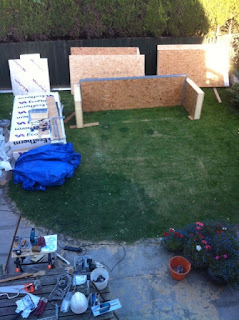 Five, because all the materials, OSB board, PIR insulation, PVA glue, nylon rods and lots of screws are readily available. The downside is also in several parts, One, we have to do this without the large workshops, CNC cutting machines and industrial glues and presses that the commercial boys have. 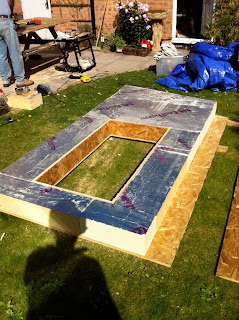 Two, i still have to pay the labour charge for a joiner, so its not free, Three, we have to apply massive levels of concentration to cutting out the parts to ONE millimetre accuracy, as the whole thing will have to be airtight and structurally fitting. Four, the boards have varying levels of slight curvature, so without an industrial press, we are reliant on Nylon rods, and keep running out! hi. thanks or sharing such inspiring post.t. your efforts are really appreciable. do keep up posting updates. One small point - I wonder why you went to the expense of buying foil backed insulation, when you have no cavity. The foil is only of benefit when inside an air void, as it provides low emmisivity and high reflectance. When sandwiched the heat flow is purely conductive.